Lake Powell is one of the most beautiful destinations a person can visit. People from around the world flock to Page, Arizona, to spend some time there. Laketime is a full-service houseboat sales and management company that wants to help create a vacation you will love on your very own luxury houseboat. Think the cost of owning a houseboat on Lake Powell is too expensive? It doesn’t have to be thanks to our luxury shared houseboat ownership programs. When you work with our company, you are able to share the cost of houseboat ownership with an elite group of fellow owners. We have the custom shared ownership programs you need to fit your individual needs. Come and enjoy the beauty of Arizona by working with us for your dream houseboat vacation. When Laketime sells you a share on a luxury Lake Powell houseboat, our service does not stop there. 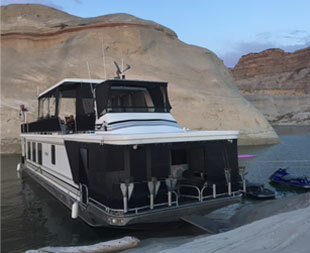 There is a reason we have established a reputation of having the 'Best Managed Houseboats' on Lake Powell! As the only full-service houseboat management company at Lake Powell, we have spent the last 25 years helping investors get the most out of their houseboat ownership. Not only do we do all of the maintenance and management work for you, including linen service, but we also provide launch and retrieve programs to ensure the best possible care for your valuable investment. When you purchase a share on any of our shared ownership houseboats, we make sure you are 100% satisfied with your investment. We have established a reputation for ourselves in having the best managed houseboats on Lake Powell. We manage and maintain your houseboat to a standard beyond your expectations. Thanks to our five trucks and five houseboat trailers, we are able to provide sunrise launches for all our clients so they can enjoy every moment of their vacation. There is no need to buy a motel room the night before you launch as you are able to board your houseboat after 7:00 p.m. on the night before launch. Enjoying a relaxing vacation on Lake Powell in a luxury houseboat shouldn’t cost you a fortune. That is why we have developed a variety of programs for our shared ownership houseboats. These programs range from houseboats with a few owners to boats with several different owners. Every year and every-other-year options are also available to help you reduce your costs. The luxury programs we offer are designed to help you enjoy the lake with the least amount of work on your part. Additionally, unlike many houseboat rentals, towel, sheet, and linen services are provided as well as environmentally friendly dish and shower soap, toilet paper, dishes, pots, pans, and even games for you and your family or guests to enjoy. Furthermore, when you take advantage of our shared ownership services, you save costly slip fees, lower your insurance costs, and save substantial fuel savings by being able to use our fueling station instead of the more expensive stations on the lake. Now is the time to truly explore the freedom of owning a houseboat on Lake Powell. We have the finest houseboats and the finest service in the area. We are ready to show you just how beautiful and accommodating our houseboats are. We have even recently expanded our site to include inside boat storage, which is centrally located between the Wahweap and Antelope marinas. Our boat storage is clean and available for access seven days a week. Make sure you take advantage of our launch and retrieval services for any watercraft stored with us. Contact us to begin your houseboat vacation in Page, Arizona. We give you the chance to partially own your own houseboat on Lake Powell.